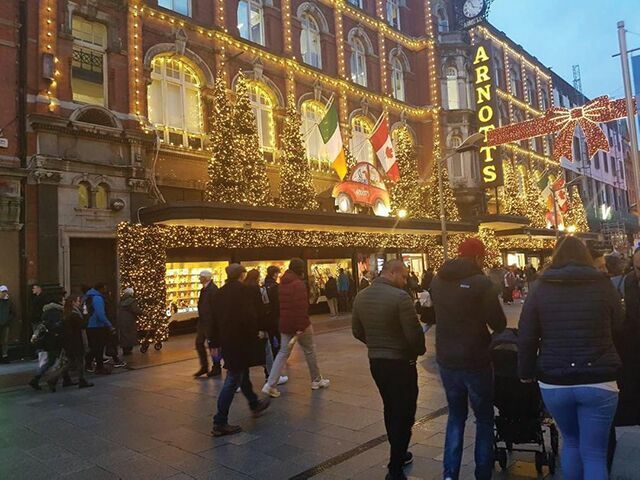 DDublin city is a magical place leading up to the festive season, watching the lights turn on through Grafton Street along with the atmosphere that the stalls bring to Henry Street. Families bonding with trips to Brown Thomas to find that perfect gift for a special someone, but what is it like really like to work in retail at Christmas? Retail is something that most of us have had the pleasure of experiencing as students. Whether it has been a summer or weekend job, there are many ups and downs and we can’t deny the perks of the job. Who doesn’t love receiving a discount or free clothes? Experience in retail teaches you so much about the public’s level of respect along with the complete opposite. There is nothing like standing on your feet for the majority of the weekend and closing on a “late night” Thursday after a full day of lectures. The closer it gets to the big day the more hectic everything becomes. The most unfortunate part of working in retail at Christmas is working both Christmas Eve and St. Stephen’s Day. Christmas Eve can be exciting and ridiculous, helping men find that last minute present their wife or girlfriend is expecting to open under the tree the next morning. Then there is St. Stephen’s Day, which is possibly one of the most dreaded days in retail. If you have ever worked in a sale before you will know exactly how it feels. Many will agree that nothing else comes close to the frustration and exhaustion one feels dashing around the shop, trying to remain calm and keep the ship afloat. A normal sale during the year is hard enough to deal with, from cleaning up the clothes off the floor to dealing with angry customers who have been waiting in line to pay. What continues to amaze retail workers is the number of people who flock to the stores on this holiday in demand to get the coat they have desired form last season that has been discounted down. St. Stephens Day should be shared with family and friends, as it is the one time of year that everyone is together, yet for retail workers the sales should be held off until the 27th as the majority only have Christmas day off to relax and spend that treasured family time. It can be very satisfying to make a customer happy, take the pressure off and allow their shopping experience to be memorable. One of the best things about working in retail is the friendships that you make along the way. Good relationships in work make a tough day that bit easier. We all love having a good laugh and rant about how our day has treated us. This Christmas, have some consideration towards the retail workers before getting frustrated with them for taking longer than usual or if they do not have what you are looking for. They are doing their best to help make your holiday special by helping you in finding that special gift.